These are photos of some of my needlepoint work over the years. 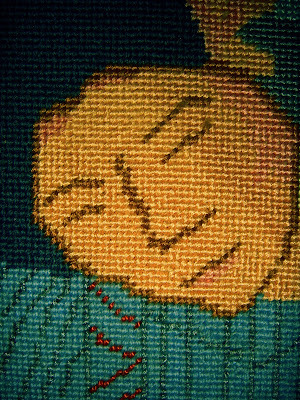 I took close-ups of small sections to show the different stitch work used ( mainly basketweave). 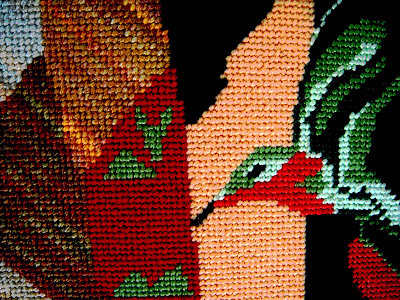 Mixed Media Monday's theme this week is "Stitches". This is my entry for the SPA challenge this week (Fishes). 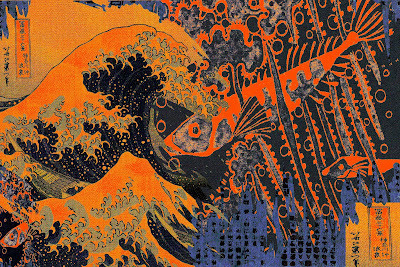 I went colorful and somewhat traditional with my take on a kind of Japanese woodblock look. The Kanagawi wave and (fossil) fishes are (Dover) images. 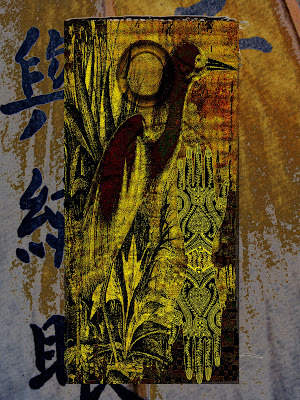 Asian stamps and artistic background papers were used as a base. Artistic filters added. This is my entry for the Three Muses challenge this week- "Give Us A Hand". 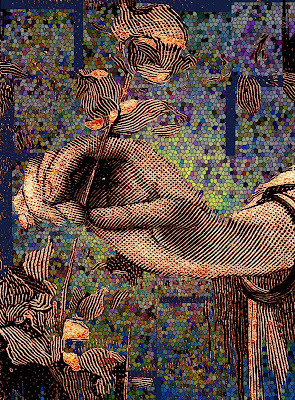 It is a digital collage made from a cropped hand image (Dover) and an image of one of my mosaic tiles I made in the background -which I altered by using a stained glass and then tile filter. The thing I really enjoyed about this challenge was viewing a lot of images of hands and finding one that was sensitve and expressive. Focusing in on just hands gives an interesting perspective to the overall piece of art as they(hands) are often so expressive in themselves- a sort of painting within a painting. Very cool challenge this week! 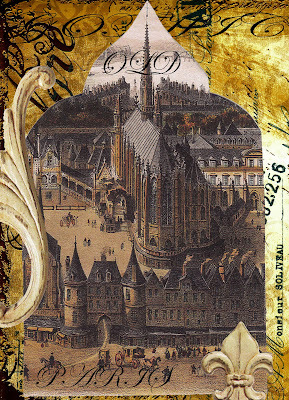 The theme for this week's Gothic Arches challenge is "Cities" and I decided upon Paris. I got a bit carried away and made two arches this week - both the same shape arch but the first one depicts Medievil Paris and the second a more modern /romantic symbol of Paris. This is my postcard entry for this week's SPA challenge "Botanica Explanation". 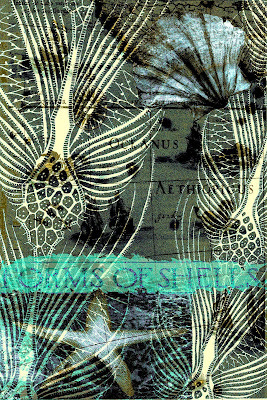 This is a digital collage built from many layers starting with a vintage sea map as a background and the use of some underwater coral and algae microscopic forms overlayed (Dover). I then added the starfish, scallop shell and labeling with artistic filters. This is my entry for The Three Muses challenge this week "Wings on things". 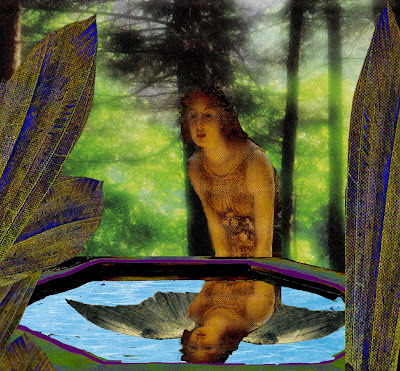 This is a digital collage showing a young woman viewing herself in a wishing pool and seeing her reflection with "wings" as she would dream to have. 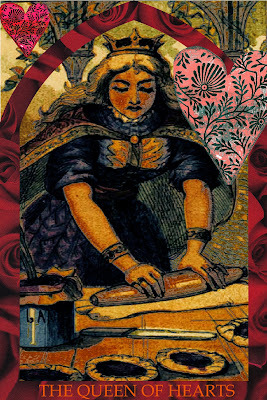 All images from (Dover)- cropped and digitally colored. I had fun learning about juxtaposition and mirror imagery in this piece. The idea behind this Mystic Theatre is not really any particular story but the idea that I have always fancied about the possibility of toys/dolls coming alive at night - so I created a little theatre for them to perform. It probably started with the "Nutcracker" when I was young and has continued until now. The film "Night at the Museum" personifies the theme more recently. This is a simple unfinished box and (I added the top trim) that I gessoed, painted, rubber stamped and in some places decoupaged decorative paper napkins. I have shown both front and back views. 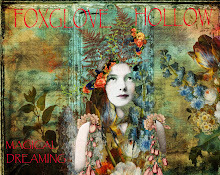 This is for the challenge at Rosie and Linda's Big Art Adventure "Story In A Box"
Immortality, the inner light that illuminates the spirit and hope. These are the words that best describe "The Star" the 17th card in the Major Arcana of the Tarot. Expectation, bright promises and direction also are associated with the archetypical meanings in a reading; in short, a positive feeling associated with stars. 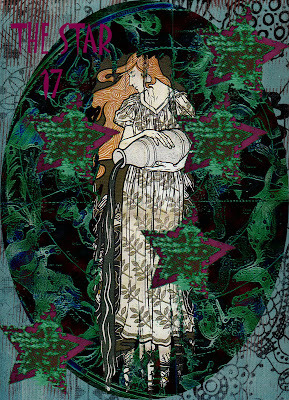 This is a digital Tarot card I made using somewhat traditional images (woman with vase of flowing water and a star chart in the background) and an addition of some more contemporary elements. This is my entry for Mixed Media Monday (Stars) . This is my SPA entry for (Glamour Girls). For the background I used a photo of Manhattan that I took from (can't remember which direction) the Empire State Building a few years back. 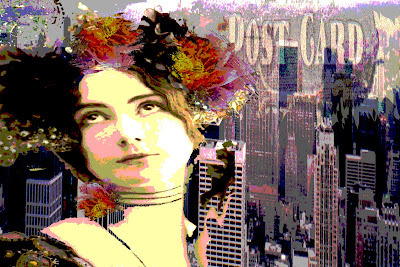 I cropped and colorized it and added the image of the young woman (Luna Girl) and added flowers (from another of my photos) to her hair and choker. Being a somewhat country girl, to me Glamour is the City ; in fact I still tend to "dress up " a bit when I go into the city (San Francisco)even though everyone is totally casual! This is my entry for SaWo (Journal Page) challenge . 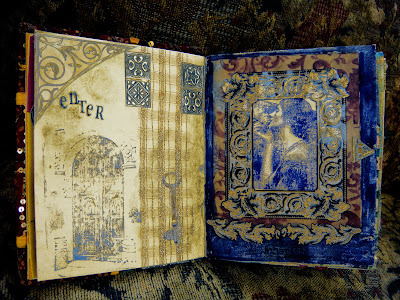 Hand painted pages with rubber stamping, decorative trims and artistic papers. (Dover image). This was a fun project for the TIO challenge "Strictly for the Birds". This is a fabric tag that I printed one of my collages on with my printer. Paper -backed canvas fabric (from Jacquard) for ink-jet printer was used -great product . The background was rubber stamped (Impress Me ) and then assorted Dover images were used for the foreground. I added the grommet with my hand tool. Photographed against rice paper- with artistic filters added. This is my entry for the Three Muses challenge . 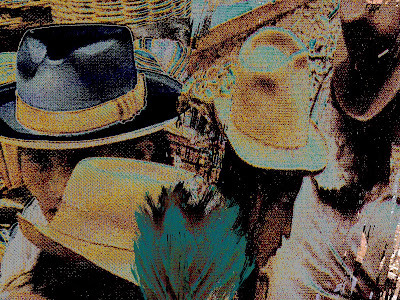 This is a digital collage I made using cropped images (public domain) to resemble a busy market place in the Yucatan- where this distinctive type of hat is worn. 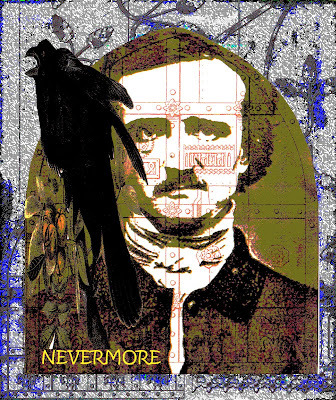 This is my entry for the Gothic Arches challenge "Edgar Allan Poe". It's been a long time since I have read any nursery rhymes but I was drawn to this image from Lunagirl and found my Real Mother Goose book with the corresponding rhyme. 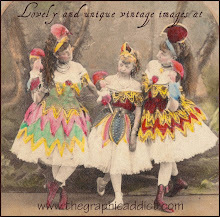 This is a digital 4x6 postcard using the main image and adding an arch from artistic papers and hearts (Christine Adolf) papers. I also added text and artistic filters. This is for SPA challenge "Nursery Rhymes". 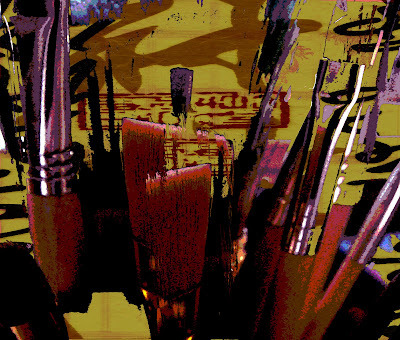 This is a digital collage made from a close-up photo of my own brushes at my art table- which I was staring at as I was pondering what to make for this challenge for TGIF! 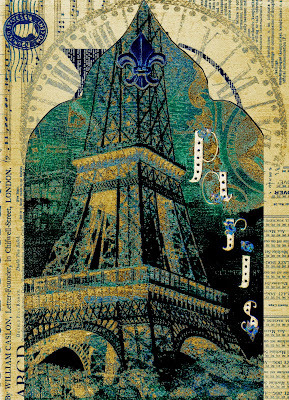 I set up the photo on a background of tissue paper and used some rubber stamps for design. I then overlayed the photo with its background erased out. 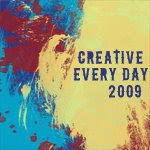 It's fun to find inspiration in everyday things! I have been working on this journal page (Le Cirque) for a little while now and I wanted to add a surreal quality to it. The theme for The Three Muses is "Art in the Round" this week so I worked with some digital effects and came up with this "spherized" quality that I think works well with this piece. I like the way the sphere seems to emerge from the canvas encapsulating the circus figure like a bubble. Background is hand painted on canvas. Face and hands from (Dover). Costume is made from fabric, trim and beads. Feathers added for headdress. 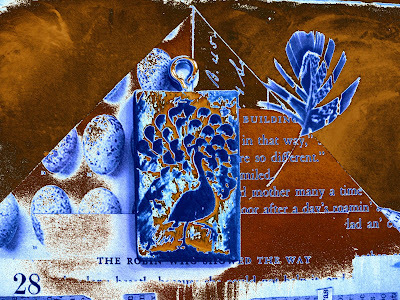 This is my entry for Mixed Media Monday- the theme is (Nature's blues and browns)- a wonderful color combination. This piece is from one of my journals . The peacock is a clay piece I stamped from a Springerle mold (House on the Hill) and hand painted . 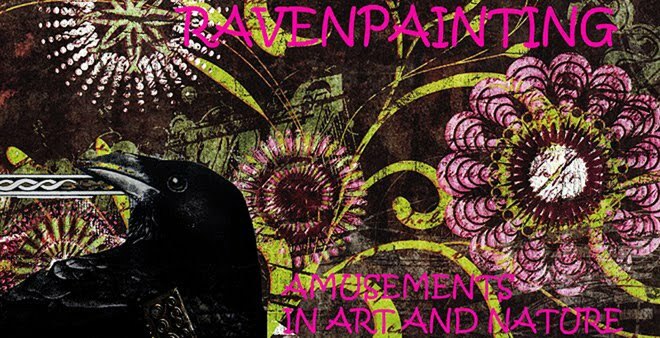 The background is hand painted and artistic papers from Character Constructions. As far as toys go my fondest memories revolve around a dollhouse that I had. It was a simple dollhouse (metal I think in those days- late 1950's ). About 15 years ago I decided to build from a kit a victorian dollhouse and had a blast. 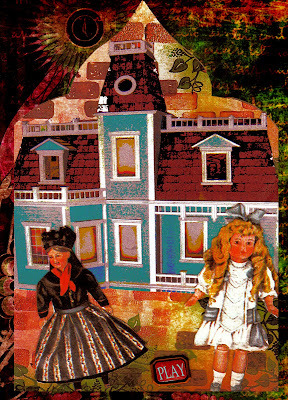 The arch I made here includes a photo of that dollhouse scanned and cropped a bit to fit. 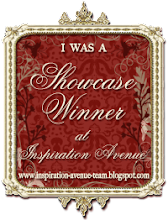 This is for the Gothic Arches Challenge - favorite toys. I decided to go south of the border to play (Mexican ) "Bingo" for SPA this week. The Loteria is in fact Bingo played with a well mixed deck of cards (instead of numbered balls on a raffle drum) that have illustrations of everyday characters, cultural legends and natural elements. The caller has a complete deck of 54 different illustrated cards, and the bingo cards for players have between 9 and 12 of these colorful motives to fill in. Instead of yelling "Bingo", "Loteria" claims the prize! 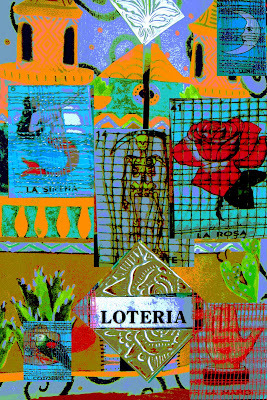 This collage was made from a journal page that I made of loteria elements - cards netting, silver ornaments and artistic papers.